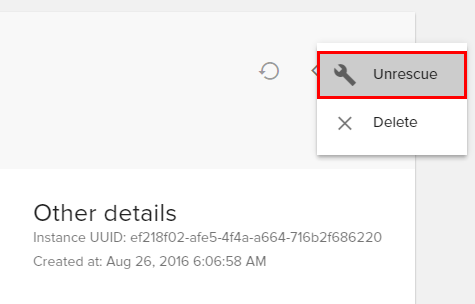 To create a new instance click the plus (+) button from the bottom-right - Create Instance. 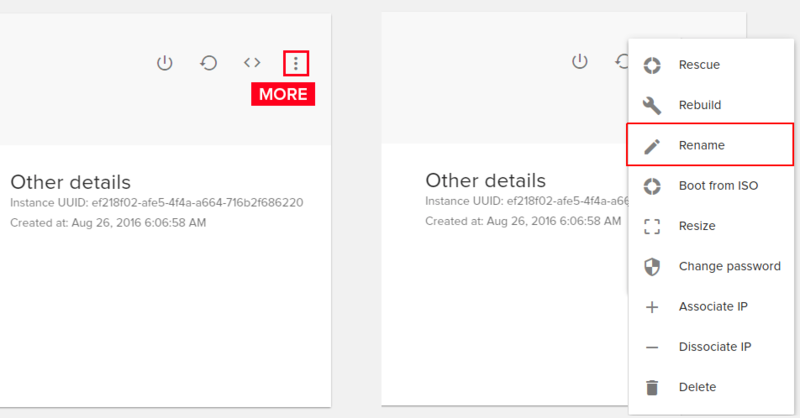 Instance Name: This will set the name in the Fleio and OpenStack database. The hostname inside the instance will not be set. Select a Region: Select the region (location) of your instance. Select a Boot source: Select the image to boot from, from the list of available images. 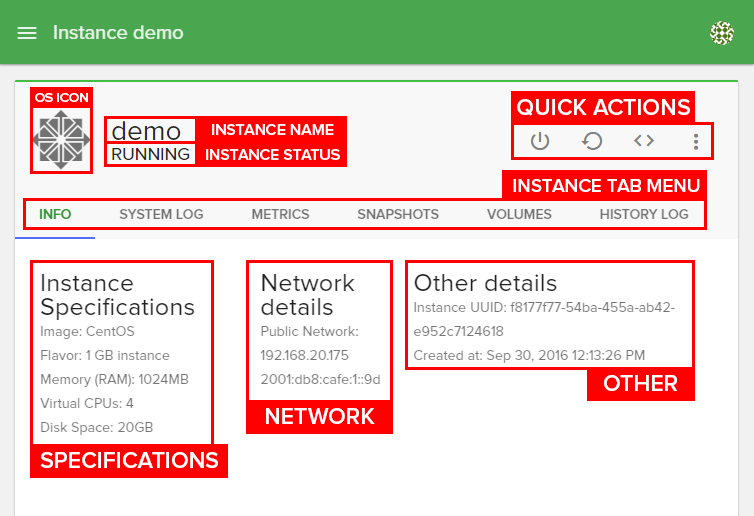 You can also boot from an instance snapshot if any is available. 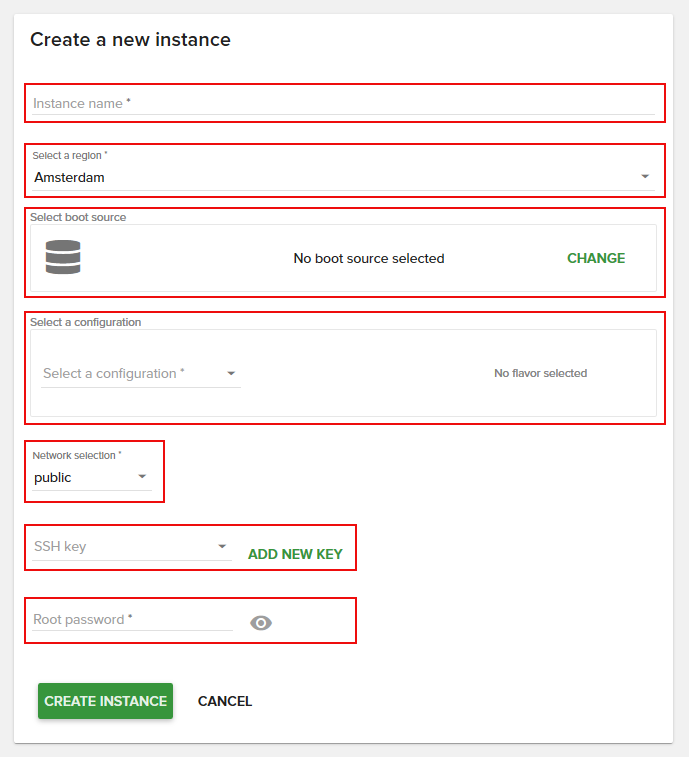 Select a configuration: In order to create the new Instance you also need to select a configuration. 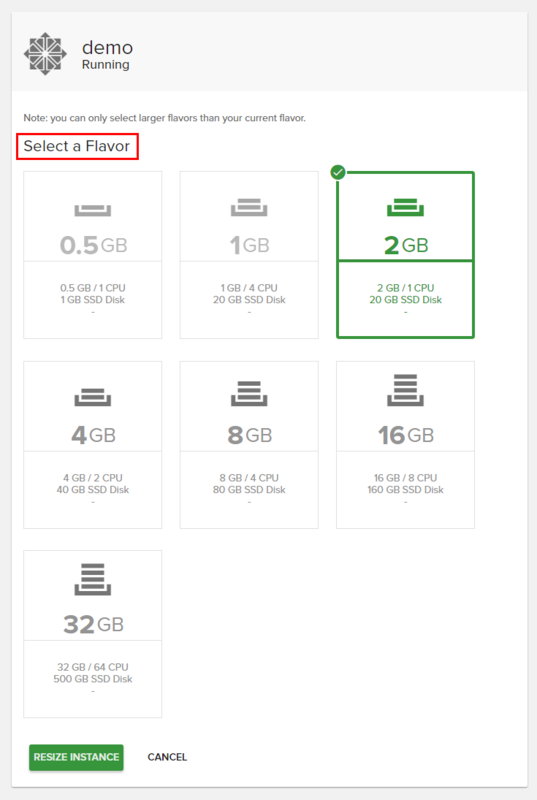 Configurations (flavors) hold information about the Instance memory, disk space and the number of virtual CPUs that will be available. Select a SSH Key: A SSH key which you previously added in SSH keys page. Also, you can add your own key or generate a new one to use. This field is optional, you can leave none selected. Root Password: You can view your typed password by clicking on the eye icon from right. The password should be at least 8 characters long and should contain at least one digit, letter or symbol. 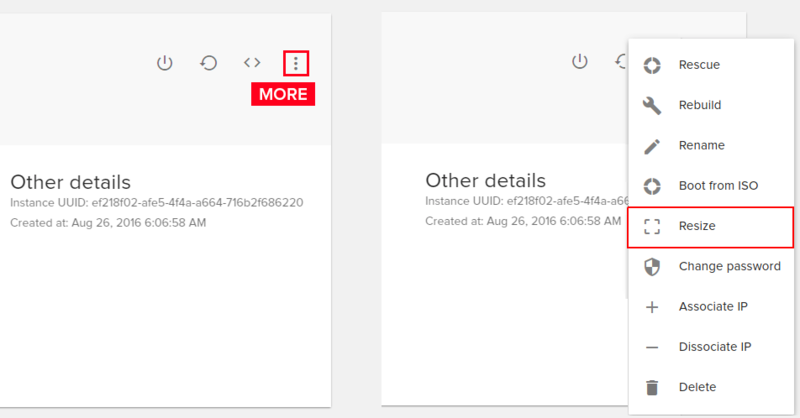 Hit Create Instance and the new instance will be created. To search for an instance, type your instance name in the search box from the top of the instance page. 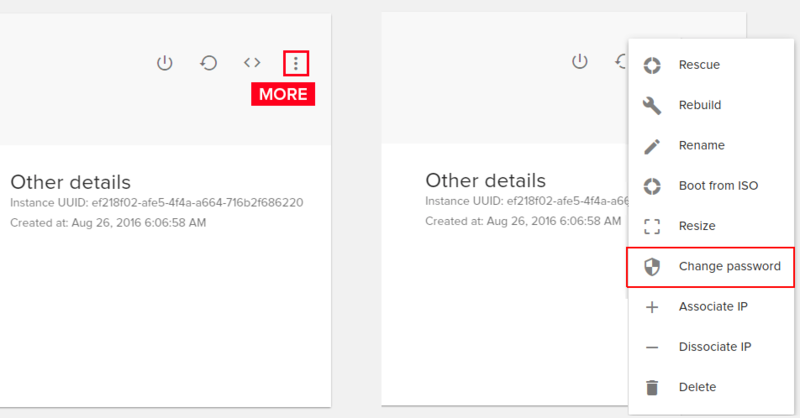 There are two ways in interface for Start / Shutdown / Restart your instance. 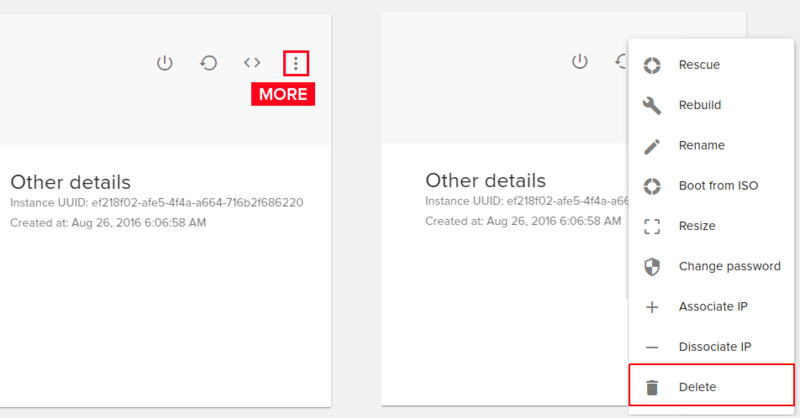 You can launch the console window directly from instance page or from instance details. After the new window with the console will appear, you can login into your VPS with your user details and start working. An instance’s filesystem could become corrupted. Rescue mode provides a mechanism for access even when the VM’s image renders the instance inaccessible. For example, a user deleted a crucial file needed to launch a VM but this is found out only after reboot. Through rescue mode you can restore the original file and start your VM. To rescue an instance click on more button (icon with 3 vertical dots) from top-right corner of the instance window and select Rescue. A new page will appear and here you can choose your image to install for rescue. You can choose an image from operating systems or from an old snapshot (backup). 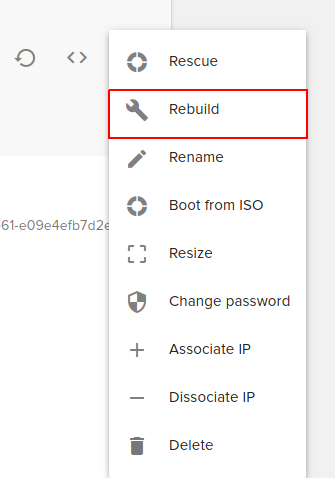 After you have set a root password you can click on Rescue Instance. 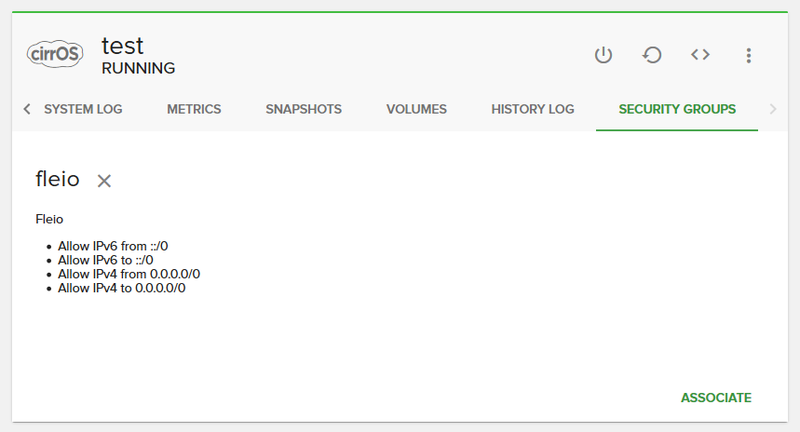 Rescue Mode will not reinstall your VPS or change/delete your files. Will just create a temporary way for you, to access your files. 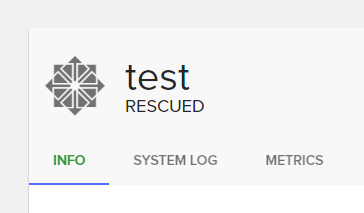 After rescue process is done you will see that your VPS status is changed to RESCUED. 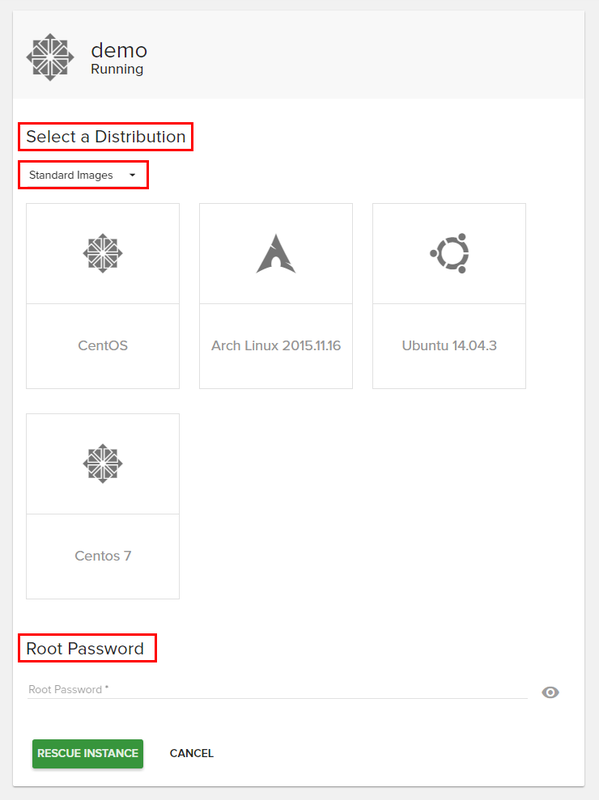 Now you can login into your VPS by launching the console and with the root password which you have set on rescue page and from there you can repair your corrupted files. After you’ve finished with that, you can exit from Rescue Mode by clicking on more and select Unrescue. Delete will delete your instance, not only rescue mode files. 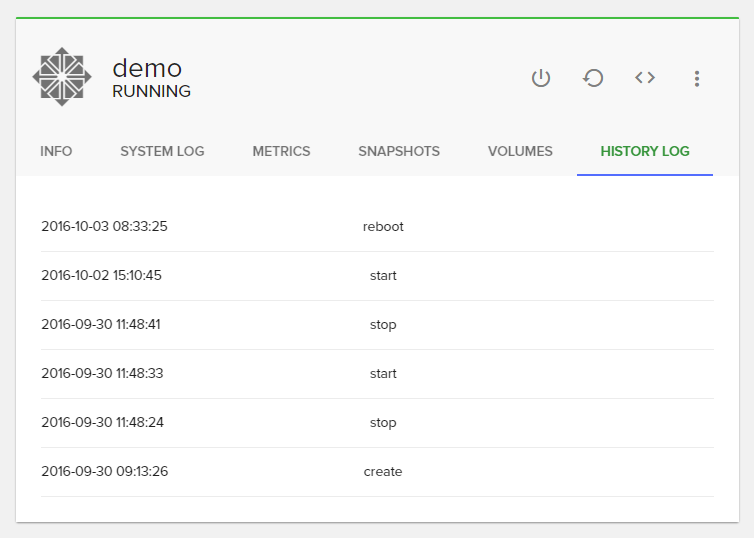 Through this feature you can basically reinstall your VPS using the same or another operating system, or even you can install a snapshot from a previous backup. All your data will be erased on reinstall. Perform a backup to avoid data loss. To reinstall click on more button and select Rebuild. Instance Name: Set name for your new instance. Root Password: The password should be at least 8 characters long and should contain at least one digit or symbol. Hit Rebuild Instance and the reinstall process will start. If you want to rename an instance, click more and select Rename. 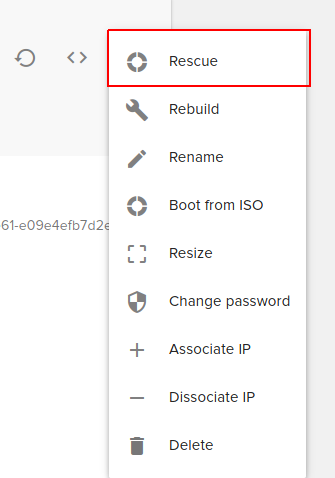 Enter the new name and click on Rename Instance. This will set the name in the Fleio and OpenStack database. The hostname inside the instance will not be set. Resizing means upgrading your current VPS to have more CPU, RAM or HDD. We’ve already have some flavors (templates) already defined, and you can select the one you want. To resize (upgrade) an instance, click more and select Resize. A new page will appear and here you can select the configuration which you need. Click on Resize Instance and wait for the process to be finished. Final step will be to Verify Resize and you can click on Confirm Resize or Revert Resize. Delete will delete your instance. Currently, downgrade an instance is not supported, only upgrading is supported. 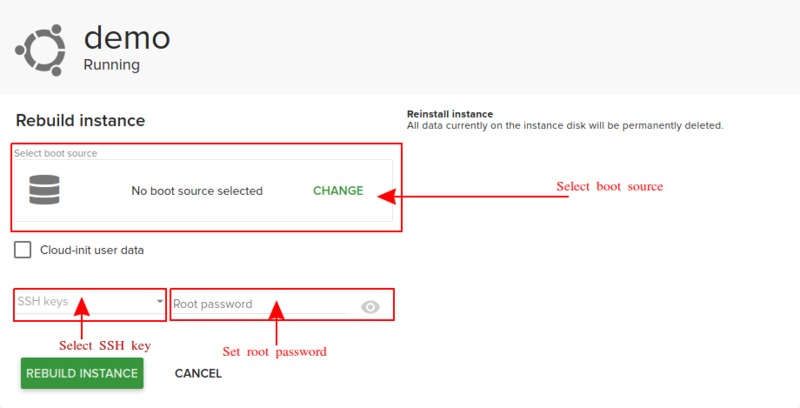 To change root password for your current instance, click more and select Change Password. Enter the new password and click on Change Password. You can view your typed password by clicking on that eye icon from right. The password should be at least 8 characters long and should contain at least one digit or symbol. If you want to delete an instance click More and select Delete. 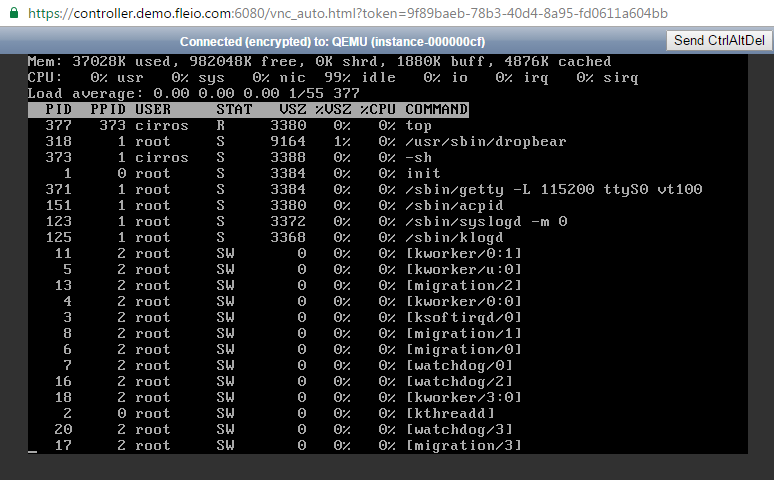 Instance name: The name in the Fleio and OpenStack database. Could be different from the hostname inside the instance. Instance status: Depending on the instance state, it could be: Running, Stopped, Mounting, Rescued, etc. Quick actions: Used for: Shutdown/Start, Restart, Launch Console, More (Rescue, Rebuild, Rename, Resize, Change password, Delete). 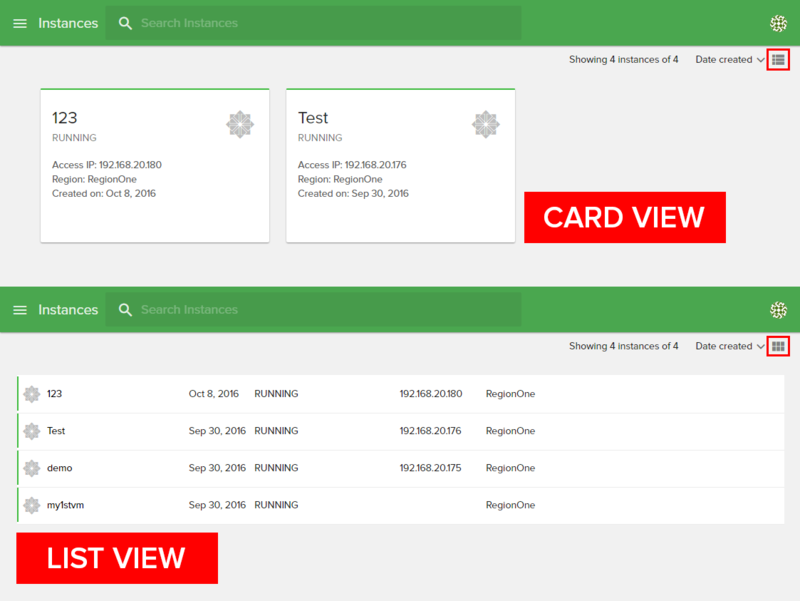 You can view directly the system log of your instance by accessing the System Log tab from instance details. To show more lines, you have a select field for this. 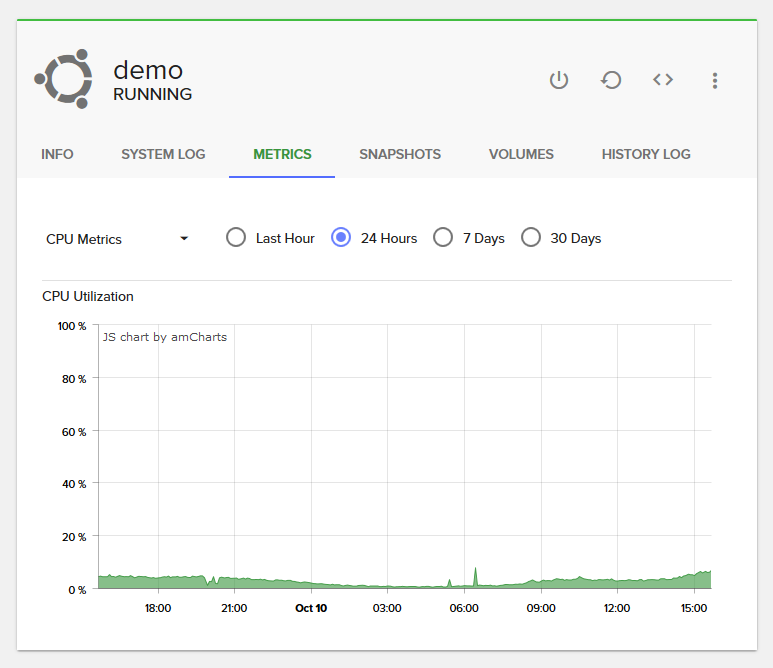 To view instance metrics like Network Traffic or CPU Usage go to Metrics tab from instance details. 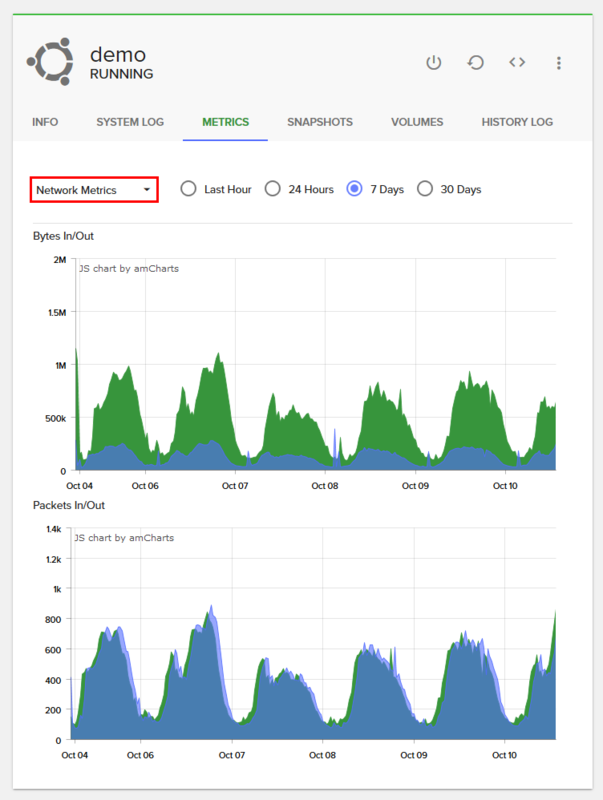 Select Network traffic or CPU Usage and filter them by: last hour / 24 hours / 7 days / 30 days. Snapshots are actually images of your current instance. You can use them to backup your instance and restore it later. Also, you can duplicate an instance by making a snapshot of an instance and install that snapshot as another instance. 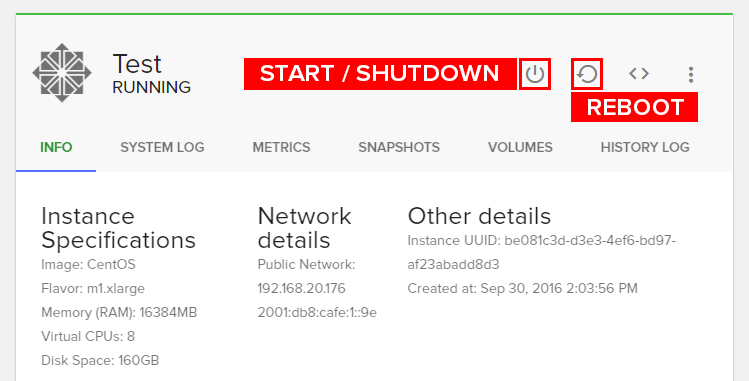 To create a snapshot of your current instance, select your instance and click on Snapshots tab. Finally click on Create Snapshot. After creation, all your snapshots will be visible in this tab, and will be also visible in Images page. From Images page, you can delete the snapshots or deploy new instances from snapshots. A volume is a detachable block storage device, similar to a USB hard drive. You can attach a volume to only one instance. To attach / detach a volume on your current instance, select your instance and click on Volumes tab. 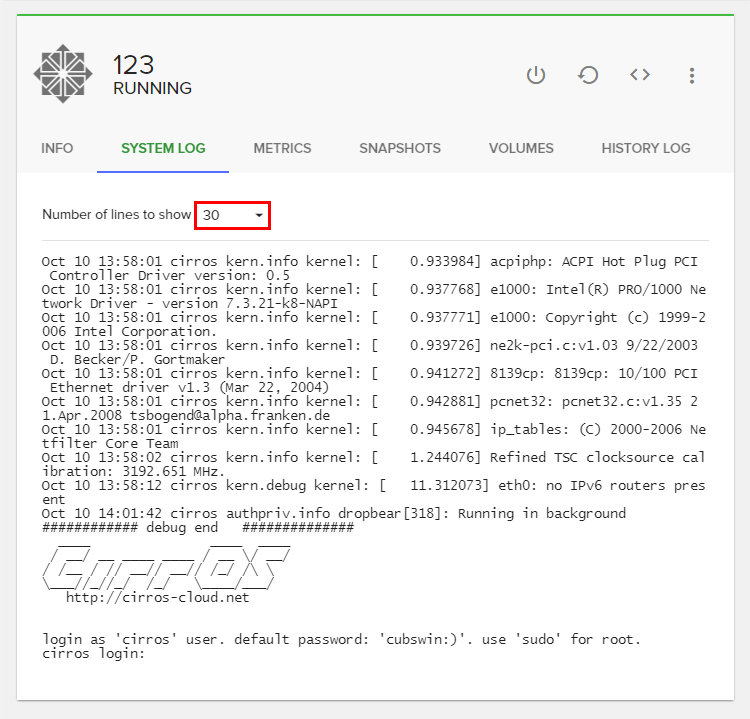 To view history log for an instance, select your instance and click on History Log tab. Here you will find all actions made on your instance, like rescued, unrescued, rebooted, changed password, etc. Security groups and security group rules allows users the ability to specify the type of traffic and direction (ingress/egress) that is allowed to pass through a port. A security group is a container for security group rules. When a port is created in networking it is associated with a security group. If a security group is not specified the port is associated with a ‘default’ security group. By default, this group drops all ingress traffic and allows all egress. Rules can be added to this group in order to change the behaviour.